Background Acute hamstring injury that includes intramuscular tendon injury has been suggested to be associated with increased reinjury risk. These observations were based on a relatively small number of retrospectively analysed cases. Objective To determine whether intramuscular tendon injury is associated with higher reinjury rates in acute hamstring injury. Methods MRIs of 165 athletes with an acute hamstring injury were obtained within 5 days of injury. Treatment consisted of a standardised criteria-based rehabilitation programme. Standardised MRI parameters and intramuscular tendon injury, the latter subdivided into tendon disruption and waviness, were scored. We prospectively recorded reinjuries, defined as acute onset of posterior thigh pain in the same leg within 12 months after return to play. Results Participants were predominantly football players (72%). Sixty-four of 165 (39%) participants had an index injury with intramuscular hamstring tendon disruption, and waviness was present in 37 (22%). In total, there were 32 (19%) reinjuries. There was no significant difference (HR: 1.05, 95% CI 0.52 to 2.12, P=0.898) in reinjury rate between index injuries with intramuscular tendon disruption (n=13, 20%) and without tendon disruption (n=19, 20%). There was no significant difference in reinjury rate (X²(1)=0.031, P=0.861) between index injuries with presence of waviness (n=7, 19%) and without presence of waviness (n=25, 20%). Conclusion In athletes with an acute hamstring injury, intramuscular tendon injury was not associated with an increased reinjury rate within 12 months after return to play. Hamstring injuries are infamous in sports due to their high incidence1–3 and their tendency to recur early after return to play (RTP),4 with reinjury rates ranging from 14% to 63%.5–7 As hamstring (re)injury risk is associated with the number of previous hamstring injuries,6 each new injury makes further injury more likely. Recently, hamstring muscle injury with tendon injury has emerged as a significant risk factor for reinjury.8 The tendon can be subdivided into a ‘free’ (ie, no attaching muscle fibres) and an ‘intramuscular’ (ie, to which muscle fibres are attached) component.9–15 Pollock et al 8 reported that hamstring muscle injuries with tendon injury (including 1 free tendon injury and 14 intramuscular tendon injuries) were associated with delayed time to return to full training and had significantly higher reinjury rates when compared with those hamstring muscle strains that had no associated tendon injury. At 3 months after RTP, reinjury rates in that study were 33% and 4% after index injuries with and without tendon injury, respectively.8 This observed difference in reinjury rate would be clinically significant if supported by prospective data. We recently showed that hamstring muscle injury with intramuscular tendon injury was associated with longer time to RTP (by slightly more than a week).10 Unfortunately, there was inadequate power to analyse reinjuries. To address the question of the relevance of associated intramuscular tendon injury in hamstring muscle strain, we combined two prospective cohorts of athletes with an acute hamstring injury who underwent imaging prior to treatment. The aim was to examine whether intramuscular tendon injury conferred an increased reinjury rate. The null hypothesis was that intramuscular hamstring tendon injury is not associated with reinjury rate within 12 months after RTP. 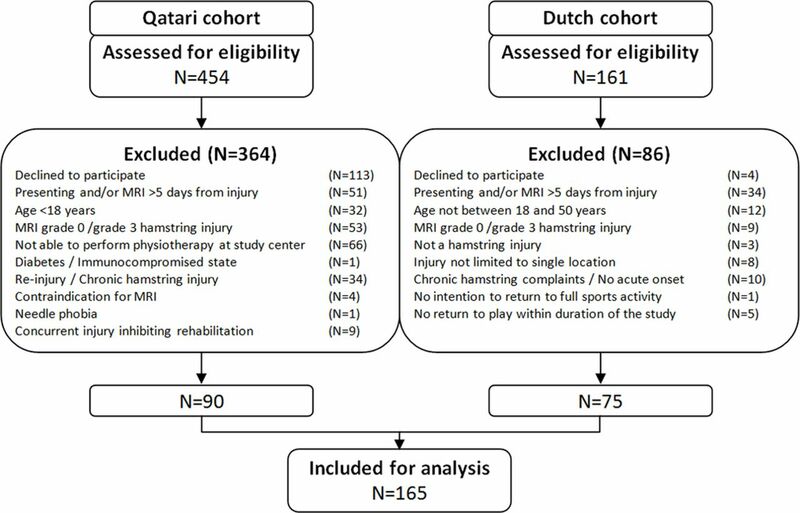 The study participants represent pooled data from two randomised (double-blinded) controlled studies on platelet-rich plasma (PRP) for the treatment of acute hamstring injuries (ClinicalTrials.gov NCT01812564 and Dutch Trial Register 2771).16 17 All participants provided written informed consent. Neither study found a benefit of PRP on the time to RTP or reinjury rate. Inclusion and exclusion criteria are shown in table 1. All participants were treated using a criteria-based rehabilitation programme. None of the participants were treated surgically. Both studies used comparable MRI protocols including sequences that are suitable for detecting muscle injury. With regard to (fat-suppressed) fluid-sensitive sequences, the Dutch study used short tau inversion recovery (STIR) and T2-weighted imaging, and the Qatar study used proton density fat saturation (PDFS)-weighted imaging. Additionally, the Dutch study used T1-weighted imaging, whereas the Qatar study used proton density (PD)-weighted imaging without fat suppression. MRIs in the Dutch cohort were obtained with a 1.5 T magnet system (Magnetom Essenza, Siemens, Erlangen, Germany) with the use of a body matrix coil. The entire injured hamstring was visualised with coronal and sagittal STIR series from the ischial tuberosity to the distal hamstring insertions on fibula and tibia (repetition time/echo time (TR/TE) of 3500/31 ms, field of view (FOV) of 300 mm and a 256×320 matrix). Following this, transverse STIR (TR/TE of 3500/31 ms, FOV of 300 mm and a 205×256 matrix), T1-weighted (TR/TE of 500/12 ms, FOV of 300 mm and a 355×448 matrix) and T2-weighted (TR/TE of 4080/128 ms, FOV of 300 mm and a 355×448 matrix) images were obtained from the injured area. MRIs in the Qatar cohort were obtained with a 1.5 T magnet system (Magnetom Espree, Siemens) using a body matrix coil. First coronal and transverse PD-weighted images (TR/TE of 3000/30 ms, FOV of 220–240 mm, slice thickness of 5 mm and a 333×512 matrix) were obtained. Then coronal and transverse PDFS images (TR/TE of 3000+/30 ms, FOV of 220–320 mm, slice thickness of 3.5 mm, a 326×512 matrix for the coronal images and a 333×512 matrix for the transverse images) were obtained. The proximal and distal free tendons have no muscle fibres attached to them.9 The intramuscular tendon was defined as the portion of the tendon extending along and into the muscle. The two previous descriptions of intramuscular tendon injuries were both incorporated into the MRI assessment.24 25 Intramuscular tendon injury was subdivided into intramuscular tendon disruption (figure 1A) and presence of tendon waviness (figure 1B).24 Intramuscular tendon disruption (ie, a focal tendon defect, loss of low signal intensity within the tendon) was scored as being present or absent. When present, disruption was divided into <50%, 50%–99% and 100% of the tendon cross-sectional area (CSA). Then, longitudinal tendon disruption was measured in centimetres: in partial disruption the craniocaudal length of the disruption, and in complete disruption the distance between the retracted tendon ends. Waviness was noted as being present or absent. (A) (left) Proton density fat saturation-weighted (axial) and (right) short tau inversion recovery-weighted (coronal) MRIs demonstrating full-thickness intramuscular tendon disruption (arrows). (B) T1-weighted (coronal) MRI demonstrating waviness (arrows) of the intramuscular tendon. The modified Peetrons classification was used to grade the injury: grade 0: no abnormalities; grade 1: oedema without architectural disruption; grade 2: oedema with architectural disruption; and grade 3: complete rupture of muscle-tendon unit.26 For the extent of oedema (abnormal high signal intensity on fluid-sensitive sequences), the craniocaudal distance (in centimetres) and CSA (as a percentage of muscle CSA) were scored. The main outcome measure was the occurrence of a reinjury in the first 12 months after RTP. Reinjury was defined as an acute onset of posterior thigh pain in the same leg. All participants were instructed to contact the principal investigator in any case of a suspected reinjury. The participants in the Dutch trial were also contacted at 1, 4, 8, 16, 26 and 52 weeks after RTP by phone. In the Qatar cohort, participants were phoned monthly. For statistical analysis, SPSS (V.23.0) was used. Cumulative incidence curves were constructed using the one minus survival function. To determine whether an association exists between intramuscular tendon injury and reinjury rate, a Cox proportional hazards model was used. In case graphical assessment of log-minus-log plots revealed that the assumption of proportional hazards was violated, a generalised Wilcoxon (Breslow) test was used. The main variable was the number of days from RTP to occurrence of a reinjury or the end of the follow-up duration. Censoring was applied if participants presented with a severe injury (>28 days of absence from sport participation) that did not involve the hamstrings during the follow-up period, or when participants were lost to follow-up. To achieve the highest power for analysis, intramuscular tendon disruption was treated as a dichotomous variable (ie, present or absent). A multivariate (ie, sensitivity) analysis was done to adjust for ipsilateral hamstring injuries in the last 12 months,27 treatment received and study cohort. Level of significance was set at P<0.05. A total of 165 participants with a median age of 26 years who sustained an acute hamstring injury were included (figure 2). Five participants were excluded from the reinjury analysis because they did not RTP during the study period, four of which as a result of another (non-hamstring) injury and one due to ongoing hamstring complaints.16 Baseline patient and MRI characteristics are provided in table 2. The median follow-up was 372 days (IQR: 362.5–385.5). In the survival analysis, 23 (14%) participants were censored due to severe non-hamstring injuries during follow-up or loss to follow-up, of whom 7 (30%) had an index injury with intramuscular tendon injury. Sixty-four (39%) participants had an acute hamstring injury with intramuscular tendon disruption. Five (3%) had an injury with partial-thickness free tendon disruption. Of the 64 injuries with intramuscular tendon disruption, there were 12 (19%) with <50%, 28 (44%) with 50%–99% and 24 (38%) with 100% disruption of tendon CSA. Waviness was present in 37 (22%) cases, of which 36 (97%) occurred in cases with more than 50% disruption of tendon CSA. There were 32 reinjuries (19%) within 12 months after RTP. Reinjury rates per group are presented in table 3. The cumulative incidences of reinjuries following index injuries with intramuscular tendon disruption and injuries without tendon disruption are shown in figure 3A, and following injuries with and without waviness in figure 3B. (A) Cumulative incidences of reinjury for acute hamstring injuries with presence of intramuscular tendon disruption (ITD) and injuries without tendon disruption. (B) Cumulative incidences of reinjury for acute hamstring injuries with and without presence of waviness. RTP, return to play. There was no significant association between presence of intramuscular tendon disruption and reinjury rate in the univariate analysis (HR: 1.05, 95% CI 0.52 to 2.12, P=0.898). Subsequently, the multivariate analysis revealed an adjusted HR of 1.07 (95% CI 0.52 to 2.19, P=0.864). No significant association between reinjury rate and presence of waviness was found (X²(1)=0.031, P=0.861). Based on post-hoc observation of the cumulative incidence curves (figure 3A,B) and to facilitate a comparison with relevant literature, a post-hoc analysis was carried out at 2 and 3 months after RTP. This revealed no significant association between intramuscular tendon injury and reinjury rates. At 2 months after RTP, reinjury rates for injuries with intramuscular tendon disruption and waviness were 16% (compared with 7% for no tendon disruption; HR: 2.21 (95% CI 0.84 to 5.81, P=0.107); HRadjusted: 2.43 (95% CI 0.91 to 6.51, P=0.077)) and 19% (compared with 8% for injuries without waviness; X²(1)=3.352, P=0.067). At 3 months after RTP, reinjury rates for injuries with intramuscular tendon disruption and waviness were 17% (compared with 8% for no tendon disruption; HR: 2.15 (95% CI 0.86 to 5.33, P=0.101); HRadjusted: 2.43 (95% CI 0.96 to 6.12, P=0.061)) and 19% (compared with 9% for absence of waviness; X²(1)=2.354, P=0.125). This prospective analysis of 165 athletes with an acute hamstring injury found that on MRI nearly 40% of acute hamstring injuries had intramuscular tendon disruption and around 20% had presence of waviness. The overall 12-month reinjury rate was 19%. There was no significant association between intramuscular tendon injury and reinjury rate. The clinical implication of these data is that there is no difference in risk of hamstring muscle reinjury whether or not there is associated intramuscular tendon injury. Our finding is in contrast with that of Pollock et al,8 who reported a reinjury rate after RTP of 33% vs 4% for index injuries with and without tendon injury, respectively. In their study, the 15 injuries with tendon injury comprised 1 free tendon injury and 14 intramuscular tendon injuries.8 In addition to reinjuries after RTP, Pollock et al noted six reinjuries during rehabilitation (henceforth referred to as exacerbations): 4 (27%) vs 2 (4%) in the groups with and without tendon injury. In our study, exacerbations were not prospectively recorded and were therefore not included in the analysis. It should be noted that, in the study by Pollock et al,8 the follow-up for reinjuries was 3 months after RTP. This brings into question whether intramuscular tendon injury could be associated with ‘early’ reinjury rate (ie, within 2–3 months). Despite the relatively large number of participants and intramuscular tendon injuries, our study was not powered to detect differences in reinjury rate at 3 months. Nevertheless, based on post-hoc observation of the cumulative incidence curves (figure 3A,B) and to allow for comparison of our findings with those of Pollock et al 8 and potential future studies, we performed a post-hoc analysis. This analysis also revealed no association between intramuscular tendon injury and reinjury rate at 2 and 3 months after RTP, respectively. First, differences in study populations could explain the different findings. Pollock et al reported on acute hamstring injuries in 44 elite track and field athletes, including 31 sprinters (70%) and 8 vertical/horizontal jumpers (18%). Our study population predominantly comprised football players (72%). In team sports, there is the possibility that a player can adjust the style of play such that ‘all-out’ effort sprinting load can be modified and the players can still compete at their previous level; we know that this is not feasible for competitive sprinters. Second, we used criteria-based rehabilitation programmes including standardised sport-specific training with predefined clinical criteria for progression towards RTP. Pollock et al 8 reported that no formal criteria for progressing to return to full training (coach-led sessions) were used. An important goal was to determine the prognostic value of MRI-diagnosed intramuscular tendon injury at baseline. Our previous work demonstrated that full-thickness intramuscular tendon disruption and presence of waviness were associated with a delay in RTP by 8–9 days.10 Yet, based on considerable within-group variance and substantial between-group overlap, we concluded that the contribution of intramuscular tendon injury to RTP prediction, and therefore its prognostic value, was limited. The present study extends these findings, considering that intramuscular tendon injury was not associated with an increased reinjury rate. The main strengths of this study are the sample size, prospective study design, blinding of treating physiotherapists during rehabilitation and the multivariate analysis. A relatively large number of (re)injuries and a multivariate analysis are considered prerequisites for investigating potential risk factors of (re)injury.28 To date, this is the largest study on acute hamstring injuries with intramuscular tendon injury. A limitation is that the two cohorts had some differences in inclusion criteria, imaging protocols, rehabilitation protocols and RTP criteria. However, this increases generalisability of our findings, and correcting for potential confounders, including study cohort, did not change the outcome of the analysis. Second, the study cohort has a limited number of athletes from sports other than football. Therefore, we underscore that our results cannot be generalised to, for example, track and field athletes. Lastly, exacerbations were not prospectively recorded, and therefore no statements can be made regarding the association between intramuscular tendon injury and exacerbation rates. As our conclusion is based on MRI findings at the time of injury, it remains unknown if MRI assessment at RTP might have added value. Future studies might focus on the value of (persistent) presence of intramuscular tendon injury and its association with reinjury rate. When treated with a standardised criteria-based rehabilitation programme, athletes with an acute hamstring injury with and without intramuscular tendon injury have comparable reinjury rates. In athletes with an acute hamstring injury, intramuscular tendon injury is not associated with an increased reinjury rate within 12 months after RTP. Athletes with an acute hamstring injury with and without intramuscular tendon injury have comparable reinjury rates within 12 months after return to play when treated with a standardised criteria-based rehabilitation programme. The authors would like to extend their gratitude to Mr Jake Bambrough for his help during preparation of the manuscript. Contributors ADvdM was involved in study design, data collection, data analysis, data interpretation and drafting. EA and MM were involved for their radiological expertise, and in the evaluation of MRI scans and drafting. RW, BH, ASHN, MHM and GJG were involved in data interpretation and drafting. JLT, GR and AW were involved in study design, data interpretation and drafting. Funding The Qatar study was internally funded by Aspetar. The Dutch trial was supported by Arthrex Medizinische Instrumente and the Royal Dutch Football Association. Ethics approval Institutional Medical Ethics Board of Aspetar and the Medical Ethical Committee of South West Holland.